The new 2001-Civic is now common knowledge. Hopefully TOVA readers are now fully aware of the various technologies that Honda introduced to this generation as well as the new model line-up. Of particular significance is the heavy use of Honda's wonder-CVT transmission the Multimatic. This transmission has in fact even replaced the standard 5-speed manual in the top of the line Civic, ie the Civic RS now comes with either a 4spd automatic (with 4WD) or the Multimatic. So what is so great about the Multimatic transmission that Honda now uses it in their top Civic models ? In my D15B article, I have elaborated on its superiority over the standard 4AT transmissions and how, in certain conditions, it can even outperform the 5MT. Nevertheless, more technical minded readers will want to know more details about how Multimatic actually works and the new innovations Honda made to enable it to handle so much power so well. The Multimatic was first introduced by Honda late in 1995 when the EK generation of Civics were introduced. The only models to really benefit from Multimatic then were the 1.5l SOHC EK3s (both with and without the 3-stage VTEC engine). Honda wrote a detailed article explaining the technological advances they made to the Multimatic transmission then. 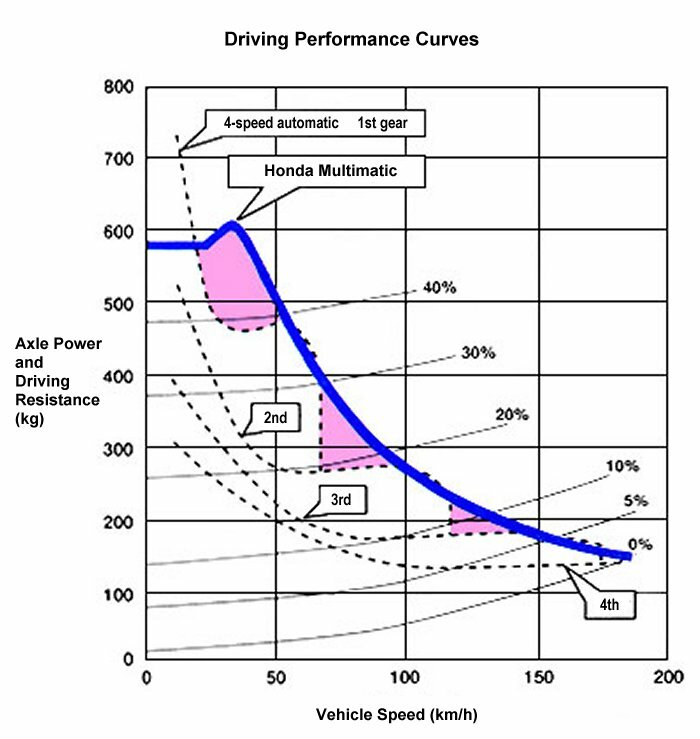 In view of the importance of Multimatic in the current 2001 Civic generation, TOVA have translated that article and re-published it here. As usual, where we feel we have useful information to add, they will be in RED-ITALIC font. The following translation was made without permission from the Honda of Japan's web-site. No matter how well the engine performs, if that power is not transmitted properly, you cannot expect desirable results. In that line of thought, one of the key factors to total power output is the transmission. So we ask - what is the ideal transmission? Currently, the automotive society is seeing an increase of automatic transmissions every year. As more automobiles with automatic transmissions become available, less skill be required for one to operate a vehicle. In other words, anyone will be able to enjoy driving and extract the full potential of the vehicle without difficulty. Because of this, the importance of the automatic transmission will only grow. 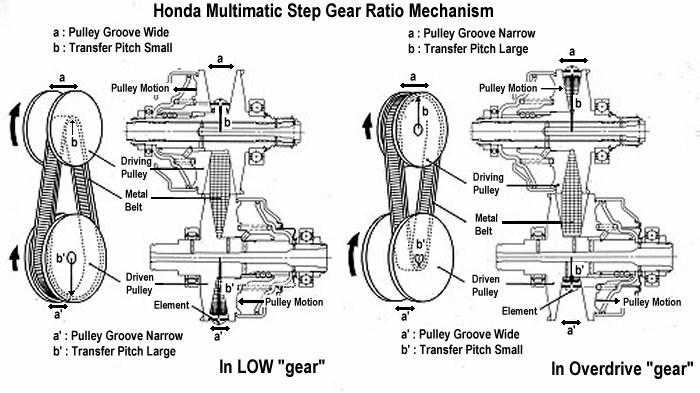 Keeping this in mind, Honda has been working on a proprietary, step-less shifting mechanism. It is but the natural progression from first making shifts smoother, to putting in more gears to make more gradual shifts -- all the way to making the shifts step-less. Compared to standard torque converters, there is less power lost, and more of the engine's power is transmitted. The slight, yet uncomfortable "nudge" that is felt when shifting will no longer exist. Acceleration will be smooth and optimal. Fuel economy will increase as well. All of these advantages can be reached with the use of a step-less transmission. While using the basic concept of the CVT, Honda was able to create the world's first mass-production, high-power, step-less transmission. While other such units previously existed, the Multimatic was far superior in quality, endurance, power output, cost, etc. Using proprietary technology, we were able to create an automatic transmission that is controllable and feels just like an automatic. The plan was to mate it to the 3-stage VTEC engine, and extract the engine's excellent performance. This was then done with the EK3 Civic, the 3-door Civic Ri and VTi and the 4-door Civic Ferio Mi and Vi. The Ri/Mi uses the standard 105ps SOHC D15B while the VTi/Vi uses the now famous 130ps 3-stage VTEC D15B. Front/Back Switch Mechanism -> Driving Pulley -> Metal Belt -> Driven Pulley -> Clutch. The two pulley widths, adjusted by oil pressure, react to the position of throttle, speed, and other conditions. For instance, when the accelerator is depressed, the driving pulley width increases. At the same time, the driven pulley width decreases - the two combining for a "lower gear" effect. By making such adjustments, we have full control over the entire gear range previously available to automatic transmissions. From LOW to OVERDRIVE - and everything in-between. In addition, the metal belt is highly flexible, and will happily accommodate the ever-changing width of the pulleys, and transfer power efficiently without any slippage. This difficult task of adjusting oil pressure, and adjusting to variable driving conditions is handled completely by the ECU, and allows the transmission to extract the maximum performance out of an engine - making this a revolutionary automotive transmission. The Honda Multimatic does not use a torque converter, but uses a newly designed multi-layered clutch. Additionally, to obtain smooth acceleration, various proprietary equipment were added in order to make a step-less transmission with high reliability and durability. Secondly, this allows for controlling the speed in all circumstances. In order to control speed, the pulley needs to be continually spinning. By placing the clutch on the driven pulley, the pulley can remain spinning even when the car is stopped. This means that in emergency situations or sudden deceleration, the transmission can quickly step down to LOW gear. Lastly, this set-up allows for the transmission to be towed. When the engine is stopped, the input from the tires is locked out by the final gear and the driven pulley. The pulley width and speed control is handled by a high/low pressure regulator. The four-way valve releases oil pressure evenly to the pulleys. Additionally, the force that pinches the metal belt between the pulleys is also controlled by the lower pressure regulator. As a result, the two pulley pistons are of the same design - allowing for a more simple design, yet allowing high power output as needed. The Front/Reverse switching mechanism was placed on the driving shaft, while the acceleration clutch was placed on the driven shaft. Because of this opposing setup, the transmission is very compact, making it ideal for a FF layout. Additionally, the input shaft from the engine is inserted into the driving shaft, allowing for the number of bearings to be decreased - which ultimately means less power lost to friction. We removed the torque converter, and instead sandwiched two flywheels - resulting in a dual-mass flywheel. Also, the harmonic resonance frequency was lowered to that of below idle - allowing us to shut out the unwanted vibrations often caused by the twisting force generated by the engine during torque rate changes. At the same time, this allows for a more direct connection to the engine, resulting in less slip-loss - which ultimately leads to higher fuel economy. The Honda Multimatic requires a high-pressure oil pump in order to operate the pulleys at optimum settings. Therefore, a highly efficient, low-friction oil pump unit was installed as a separate unit. This not only enhances the reliability of the transmission, but greatly reduces power loss and enhances both driving performance and fuel economy. The power transfer belt was newly developed by the Dutch company Van Doorne's Transmissie. With careful testing, we were able to take the best of both the belt and the engine to make a superb engine with high output and a wide selection of gear ratios. 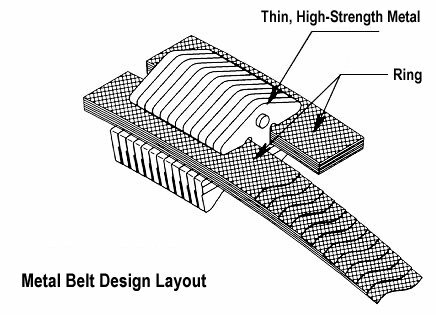 Additionally, the belt proved to be extremely silent, due to its many hundreds of elements and the use of highly durable, yet thin metals. The transmission is under full electronic control in order to attain its goals of a smooth ride and excellent fuel economy. This is largely separated into 3 sections - Gear Ratio Control, Acceleration Control, and Side Pressure Control. Gear Ratio is controlled by a pre-set 3D map with car speed, throttle position, and ideal engine rpm as its 3 axis. The difference between current and ideal engine rpm on the chart is continuously fed back to the ECU. Using linear solenoids, the four-way valves controlling pulley width are activated. In addition, the standard "L" gear gate; and the "S" mode are available to use as engine brakes. A note about the quoted red-line figures. They seem to be for the regular 105ps SOHC D15B. For the 130ps 3-stage VTEC D15B used on the EK3 VTi and Vi, the 'red-lines' for the 3-modes (based on actual usage of the real thing) are 4500rpm, 6000rpm, and >7000rpm. Redline for the 3-stage D15B is 7200rpm and under sustained WOT, engine rpm will happily hit and sustain 7200rpm ! (for the VTEC sound fans, yes, this means you can maintain the 'VTEC song' for as long as you like). The acceleration clutch's power transfer amount is controlled via the clutch piston's oil pressure. Additionally, the amount of creep is also controlled here as well. The "smart" creep has two settings - one with the brakes on, and one with the brakes off. While the brake pedal is depressed, there is very little to no creep, while releasing the brake pedal will engage creep again. By dropping the creep level while the automobile is stopped, additional fuel efficiency is realized. In addition to the standard step-less transmission's oil-pressure controlled layout, we considered the effects of torque on the pulleys and belt. By applying linear pressure, friction is lowered, and the oil pump does not have to work as hard. Both yield in high fuel efficiency and better endurance of the transmission. 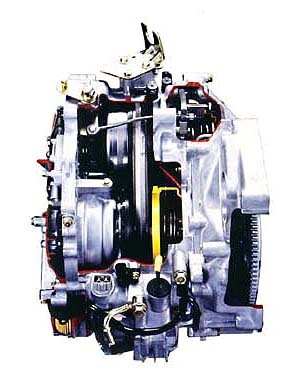 From its unique design, the Honda Multimatic is superior to conventional automatic transmissions using torque converters. By using the 3D map control pattern, the Multimatic has the ability to stay in the same power band if/when needed. An example of this is the ability to remain in the high-rpm power band from a standstill to high speed. Because of this, full-throttle acceleration is equivalent to that of a manual transmission. In addition, when traveling at high speeds, because of its ability to infinitely adjust gear ratios, the Multimatic has more passing ability than not only the manual transmission but the conventional automatic transmission using torque converters. With these advantages and the ability to still "shift" to "L" to use the engine brake, there is nothing but advantages. Because the Multimatic allows the engine to remain in its most optimal power range, excellent fuel economy is obtained. Compared to conventional automatic transmissions using a torque converter, there is zero slip, which translates into efficiency. In addition, the low-friction design and the side pressure regulator both contribute to excellent fuel economy. Because the newly designed clutch is installed on the driven shaft, smooth acceleration is possible. With appropriate creep, starting on hills or parking in garages can be done with ease. The difference in "feel" between the Multimatic and a conventional automatic transmission using a torque converter is minimal. With the infinitely adjustable gear ratios at its disposal, the nudging motion caused by shifting is no longer present. Drastic jolting during lower gear acceleration is no longer present as well, leading to a stress-free, smooth driving experience. Normal city/freeway driving with "D," superior fuel economy with "E," and high-rpm power from "S." With the 3 modes of driving, you can select your car's behavior depending on your objectives, or situation you are in. Such precise control is only possible with the Honda Multimatic. Note : There were mentions of a "2" gear gate in the original article but I have never seen such a gate in the EK3s I have seen (all original JDM imported used from Japan) so I have edited those references out. However, I am not sure if this is available on the new 2001 ES/EU generation Civic. A word about the comparison chart. In my opinion it doesn't show the true advantage Multimatic has over the standard 4AT transmission especially "on-the-move", ie acceleration from medium speeds (~ 50kph). Going WOT in any mode (E, D, or S) will cause Multimatic to use the highest possible engine rpm (>7000rpm for S) which delivers the optimum gear ratio for the highest possible acceleration from then onwards. This feature offers superior pick-up from 4AT and superior flexibility over 5MT during driving. Recently I also saw a Dynojet power chart for an EK3 Civic Ferio Vi. The standard 4AT mated to the 130ps SOHC-VTEC D15B (1991-1995 EG4 and EG8 Civic VTi) will dyno at around 92ps at the wheels. However the EK3's dyno chart I saw touched 100ps at the wheels, stock-standard.